How to Add Warmth to your Ski Lodge this Winter! Australian ski resorts have enjoyed record snowfalls due to an arctic vortex that recently affected the area. It’s a great time to hit the slopes yourself or take advantage of the country’s many business opportunities related to skiing. Whether you’re opening a new ski lodge, or you run an established one, having the right atmosphere and look makes a huge impact on your guests’ overall vacation experience. If your lodge is brand new or just needs a cosmetic makeover, here are a few tips to help you decorate it with flair. Ski lodges and chalets traditionally include a large common area featuring a fireplace; this is where guests can sit and relax, enjoy the company of new friends and talk about their skiing feats and challenges. The room reflects the overall atmosphere of the guest rooms but with a warmer and more inviting look and feel. During the daylight hours, you can utilize natural light through open windows to create an airy, open feel; this is especially effective on sunny, bright days. 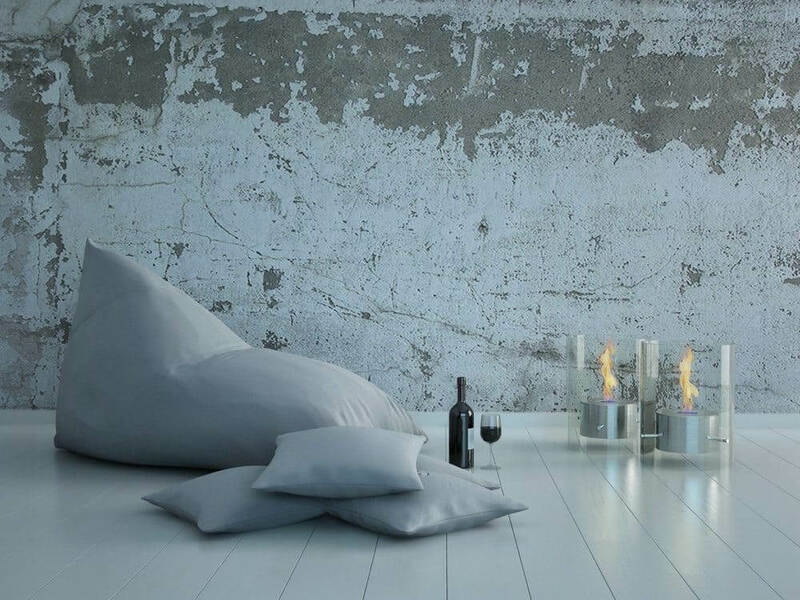 At night, soft lighting and a crackling fire work together to create the perfect mood. When it’s cold outside, and your guests are exhausted, you want your lodge to be comfortable and warm with soft, soothing light and a rustic look that matches the architecture of the building. To complement a log cabin or any style with natural wood walls and floors, choose neutral, warm colours as the foundation for your decor. White, brown, tan and soft green reflect nature and create a calm, earthy environment. Add a few splashes of warm but bright colours such as deep reds or vibrant yellows to break up large, uniform areas. Be sure that your ambient temperature remains as warm and comfy as the room’s colors. Avoid bright lighting. Instead, opt for gentle, soft overhead light from a rustic-style chandelier. Lighting for casual atmospheres can be made from tarnished metal, iron or even wood. If overhead lighting isn’t an option, look for provincial table lamps, wall sconces and lantern-style alternatives. Candles and oil lamps are always welcome additions; just be sure they are kept out of the reach of curious children. Likewise, be certain you don’t place anything flammable too close to your fireplace, and always place a reliable safety screen in front of open flames. Rustic or simple, country-style furniture is ideal for your lodge. Heavy, sturdy and chunky wood chairs, benches, tables and couches fit the casual atmosphere and can hold up under the strain of heavy use. When choosing your furniture, remember that comfort is the primary consideration. Your lodge is a place where people come to relax and not to fuss over delicate furnishings or squirm in uncomfortable chairs. Upholstered items should be covered with durable fabrics that can tolerate small amounts of melted snow without harm and stand up to the sharp fasteners and rivets on rugged outdoor clothing. Wooden rocking chairs, complete with plush seat cushions, are a homey touch. Be sure to include a large centre table and several end tables for guests to use. Keep your tables relatively clear so they are available for maps, board games, drinks or snacks. If you are providing electronic equipment such as video players or flat screen televisions, try to find entertainment centre units that hide your electronics behind closed doors or otherwise mask their sleek, modern look. Large, plush bean bags are indulgent additions that can give a “wow factor” to any lodge. Bean bags are among the most comfortable and versatile seating solutions available, and they offer many other benefits when used in a lodge setting. They are appropriate for any age group. Small children and elderly grandparents alike enjoy the airy softness and freedom of resting comfortably in a beanbag. Unlike your heavy wood items, bean bags are lightweight and completely portable. They can be stored out of the way when extra seating is not needed. You can even stack them in a corner; they will look attractive and colourful instead of seeming misplaced. Besides being practical and comfortable, bean bags are an affordable addition that won’t kill your decorating budget. Because they must endure heavy use from many types of users, your chosen bean bags need to be top-quality products. 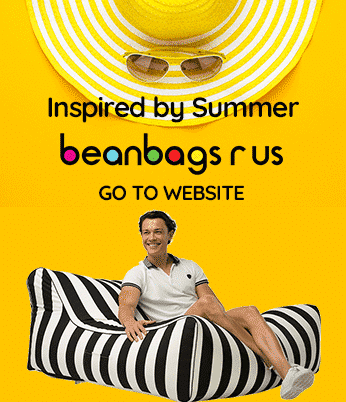 Bean Bags R Us produces the most durable and well-made luxury bean bags on the market, and three of them are perfect for warm and cozy lodge decor. The posh Lauxes bean bag features an ultra-luxurious, silky faux-fur cover that rivals the softness and looks of real fur. It’s warm, and the massive 120cm diameter will keep any lodge guest warm as he or she enjoys a relaxing break by the fire. Large enough to seat two people, this is one to induce romance while on a ski holiday. Like all bean bags in the luxury line, Lauxes includes a separate mesh liner for easy filling and childproof YKK safety zippers. If you want to represent the resplendent snow on the slopes, the Snow White shaggy faux fur bean bag is your perfect pick. Like a gigantic soft snowball, it engulfs you in airy softness, but its embrace is warm and comforting instead of chilly. It features the same large 120cm dimensions as the other luxury model bean bags, but it boasts a budget-friendly price. If you need a large number of bean bags, the Snow White can fill your lodge with whimsy, fun and comfort for less money. There is also a ninety-centimetre diameter version, suitable for children or smaller adults. For added flare use one or two of each style. 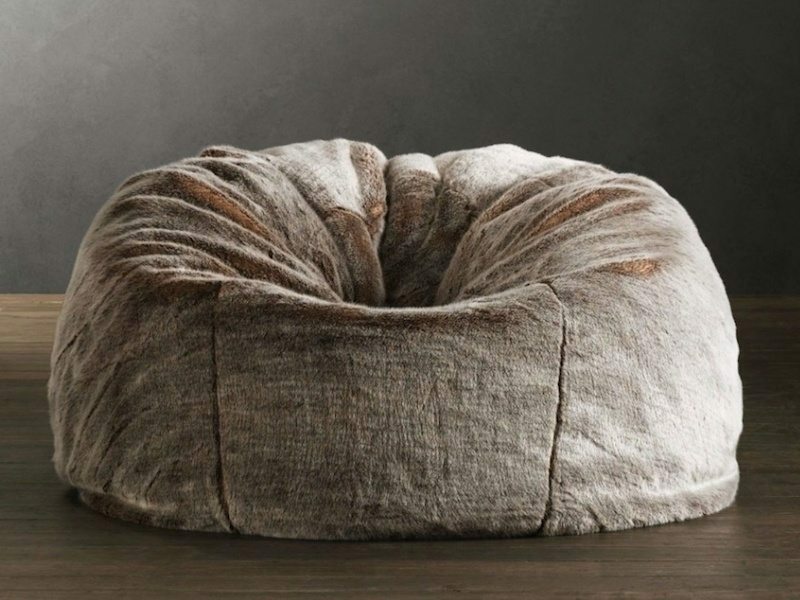 The glamorous, elegant Cappuccino 120cm simulated fur bean bag provides a realistic look without harming any animals. The rich, natural colours complement any rustic decor while adding an element of sophistication and the ultimate in comfort. Only the best quality faux fur is used in our luxury range. Just imagine snuggling up in front of an open fire in one of these! All of our luxury range of bean bags require four hundred litres of bean bag filling, which is sold separately. Here are a few more ways you can tie in ski-themed elements and make your lodge warm and inviting. Decorate your walls with themed art, area maps or relevant information that can help maximize a guest’s enjoyment of the slopes. Add fragrant woods to your fire, or burn scented candles to create a gentle, alluring scent. If you have wood floors, make use of large area rugs to add warmth, colour and texture. Provide candy jars with mints for guests, or create a small complementary beverage and snack station. Display figurines, posters, metal wall art and other items that relate to skiing or snow. For the convenience of both you and your guests, remember to provide basic needs. You’ll need ample space for coats. A wood coat rack goes well with rustic decor. If a standing rack is not ideal, attach hooks to an open wall. Provide a safe, waterproof area for boots, shoes, skis and other wet items, and be sure to place heavy door mats by every entry door to minimize tracked-in dirt and snow. Provide disposable or reusable coasters for your guests’ drinks, and hang a large wall clock so guests can keep track of time. One of the perks of decorating in a rustic style is that you don’t need a huge budget for optional decor items. Old trunks and barrels can be transformed into tables. With a little paint, old doors and windows become amazing country craft items to display on large walls. Simple, inexpensive final touches can also make a huge difference in the overall appearance of common areas. Make table centrepieces with candles, fruit, fresh flowers, sticks, live garland or pine cones in baskets or glass dishes. With a little imagination, almost anything can become an element of rustic art. If you need more inspiration for creating the best ski lodge decor, borrow some from Australia’s most popular lodges and resorts. Visit Mount Hotham, Mount Buller, Falls Creek, Perisher, and Thredbo for ideas; check out the beautiful lodges in Queenstown, New Zealand too.